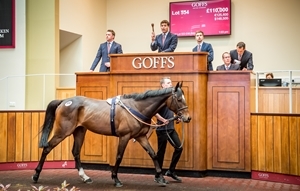 High demand at all levels of the market for Horses-in-Training saw the second and final day of the Goffs UK Spring HIT/P2P Sale at Doncaster achieve an impressive clearance rate of 92% while the overall sale average and median grew by 7% and 20% respectively. Yesterday’s session topper, the £280,000 Irish Point-to-Pointer Ask For Glory (Lot 409), retained his place at the top of the sale with today’s trade headed by Alan King’s dual winning Hurdler Coeur De Lion (Lot 554) who sold to Stephen Kemble Bloodstock for £110,000. The gelding was one of nine lots to sell for six-figures over the two-day sale – equalling the number achieved at last year’s outstanding sale. Another lot to feature in today’s session was Meikle Ben Stables’ Hurdle winner and Gr.3 placed Burbank (Lot 666) who sold to Highflyer Bloodstock for £95,000. “Yesterday’s sale topping Point-to-Pointer clearly demonstrates this sale’s ability to achieve exceptional prices for top-class horses. The Select P2P/Form Horse Session is growing every year and is now an established outlet for high-end young horses following our Aintree Sale in early April. “Demand for horses across the three days this week has been excellent and today’s clearance rate of 92% is another superb result for all involved. Every year the Spring Sale attracts the who’s who of the National Hunt world and this week has been no exception, we have welcomed a huge crowd to Doncaster, delivered an exceptional buying bench and have sold so many cracking horses.